The Hudson Museum maintains a collection of over 9,000 ethnographic and archaeological objects including a world class assemblage of Pre-Columbian ceramics, lithics and gold work dating from 2000 BC to the time of the Spanish Conquest. This collection is complemented by contemporary ethnographic objects from Mexico, Guatemala and Panama. The North American collection includes Native American and Native Alaskan & Hawaiian objects from the Northwest Coast, Arctic, Plains, Southwest and Northeast. The Maine Native American collection boasts over 900 objects, including the largest institutional collection of Penobscot basketmaking tools in the region. Southwestern holdings include historic Pueblo pottery, Hopi kachinas, Navajo textiles, Pima and Havasupai basketry, Navajo and Zuni silverwork and contemporary art. Arctic holdings feature ethnographic clothing, tools and weapons. The collections of the Hudson Museum are in compliance with Public Law 101-601, the Native American Graves Protection and Repatriation Act of 1990 and Title III of Public Law 97-466, and the Convention on Cultural Property Implementation Act of 1983. Learn about donating to the collections. Among the collections of the Hudson Museum is a Northwest Coast transformation mask that inspired the Seattle Seahawks logo. 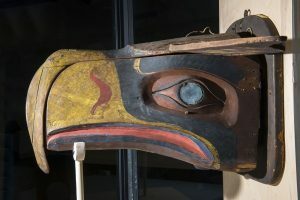 When the Seahawks won the Super Bowl in 2014, the Burke Museum at the University of Washington posted a blog about this mask and to the writer’s surprise, we notified them that the mask was at the University of Maine. The mask, known here as HM5521, is part of the Hudson Museum’s William P. Palmer III Collection. Palmer, of the UMaine Class of ’58, was a great supporter of UMaine Athletics and left his world-class collections to the University. In November, the mask travelled to the Burke Museum at the University of Washington in Seattle to be included in a temporary exhibit. It was unveiled at a press conference with the Lombardi Trophy and former members of the Seattle Seahawks, including quarterback Jim Zorn. The mask from Maine has been a huge hit at the Burke and has even been visited by the governor of Washington. The mask has returned to Orono, and will be placed on display at the Hudson Museum. The William P. Palmer III Collection represents a broad spectrum of Precolumbian and Northwest Coast art collected between 1958 and 1970 and provides the foundation for the traveling exhibits Images for Eternity: West Mexican Tomb Figures, Worldviews: Maya Ceramics from the Palmer Collection, and Cosmos in Clay: Ancient Ceramics and Gold from Panama and are also featured prominently in our newWorld Cultures gallery. Objects in the collection include over 750 tomb figures from the Colima, Jalisco and Nayarit cultures of Western Mexico, making it the largest institutional collection in the United States and a significant resource to researchers and the general public. The collection includes 1,150 ceramic figurines, mostly from the Michoacán and Chupícuaro cultures of Mexico, as well as important examples from Teotihuacan, Maya, Tlapacoya, Tlatilco and Huastec cultures. William Palmer’s collection of Maya artifacts includes 200 examples of ceramic, jade, bone and stone from Guatemala, Honduras and southeastern Mexico, including polychrome vases from the highland sites of Nebaj and Chamá. Approximately 225 ceramic, jade, stone, bone and metal objects in the collection represent the Olmec, Aztec, Mixtec, Zapotec and Veracruz cultures of Mexico and Central America. The collection also includes 225 Coclé polychrome ceramics and gold items from Panama, 25 jade, stone and ceramic objects from Costa Rica, 50 Casas Grandes and 45 Mimbres ceramics from the greater Southwest, 15 Peruvian ceramics, 5 Ecuadorian ceramics and 20 Mississippian ceramics and stone objects. Additionally, William Palmer bequeathed more than 200 exceptional ethnographic objects from the cultures of the Northwest Coast of North America. The Hudson Museum’s collections were formed around the core of more than 300 ethnographic objects gathered by Museum founder and former director Dr. Richard G. Emerick during his fieldwork among the Havasupai of the Southwest United States (1949-1953), the Iglulingmiut of the Canadian Arctic (1953-1954) and the Kapingamarangi and Kusai of Micronesia and Western Polynesia (1956-1957). In addition, his collection includes objects collected by Arctic explorer Vilhjamur Stefansson (1906-1912), including weaponry and domestic items, and objects from the North American Plains and Pacific Northwest. In 1972, the Portland Society of Natural History closed its doors, placing a major portion of its ethnographic and archaeological collections on permanent loan to The University of Maine. Resolution of that loan gave the Hudson Museum title to 195 ethnographic and 870 archaeological specimens. Archaeological specimens include 61 Mississippian stone and ceramic objects, some of which were collected and documented in the personal journal of Maj. C.H. Bayd. Other archaeological materials include a number of sherds and stone tools collected from the ground surface in New England, the Southeast, Plains and Southwest. The ethnographic portion of the collection consists of 67 examples of Plains material culture, some collected by Col. Henry Inman, and 51 items from the Southwest, such as the Mabel Weeks Collection of Pueblo pottery and Navajo textiles, with four rugs dating from 1900-1920. The ethnographic collections are rounded out by 41 objects from Asia and smaller assemblages of items from the Arctic, South America and Micronesia. Donated to the Hudson Museum through the Salgo Trust for Education, the Nicolas M. Salgo Collection forms the foundation of the Museum’s New Guinea collection and includes objects collected by Ambassador Salgo from the Sepik River region of Papua-New Guinea in 1980. The collection includes examples of art work by the Abelam, Iatmul, Ewa, Chambri and Papuan cultures located along the Sepik, Karawari and Black Rivers in the East Sepik Province of Papua-New Guinea. Most of the collection represents art manufactured for sale to tourists modeled after male cult objects. These objects show the impact of the Western art market on traditional lifeways of the Sepik River. The depth of the Museum’s New Guinea collection was supplemented in 1996 by the Faith White Collection, donated in memory of Ralph White, MA 1939, University of Maine. The majority of the 58 piece collection was assembled by Ralph White when he was stationed in Papua-New Guinea and the Philippines as a member of the U.S. Army Signal Corps (1944-1945). Collected during a period prior to extensive contact with the Western world, the collection includes objects from the Tari culture of Papua-New Guinea, dating from 1880-1890. The collection also includes 16 traditional musical instruments, figurines and leather theatrical screens (nang yai) from Thailand, Cambodia and Laos. The Maine Indian collection consists of more than 900 objects and features the largest institutional collection of Penobscot basketmaking tools in the region, including basket molds, splint gauges, crooked knives, awls and numerous samples of basketmaking material including ash splints, China (or Hong Kong) cord and sweetgrass braids. This collection also includes baskets, dating from 1870 to present, root clubs and walking sticks, as well as examples of Maine Native American beadwork and birchbark objects. Three full-size birchbark canoes dating from the late 19th century to early 20th century are also included.